Mr. Thumbay Moideen, the Founder President of Dubai-based global conglomerate Thumbay Group, was conferred an Honorary Doctorate at the annual convocation ceremony of Amity University – Dubai, on 20th November 2017. Mr. Moideen, the Guest of Honour of the convocation ceremony, was awarded the doctorate in the presence of distinguished dignitaries, academicians, students, teachers and parents. In his acceptance speech, Mr. Thumbay Moideen expressed his gratitude to Amity University Dubai for awarding the doctorate. “Throughout my career, I have had the privilege of transforming lives through education and healthcare, strengthening communities and contributing to the growth and progress of the nation. I owe my success to God Almighty, the support of the government, and my team. This recognition will inspire me to do more in driving positive change,” he said. Mr. Thumbay Moideen awarded certificates to the graduates and the honors for batch toppers. Mr. Thumbay Moideen is the Founder President of Thumbay Group, a diversified international conglomerate headquartered at DIFC – Dubai, United Arab Emirates (UAE). Starting with the establishment of Thumbay Group in 1998, he has set up business operations in 20 sectors. Today, the Group has activities in Education, Healthcare, Medical Research, Diagnostics, Retail Pharmacy, Health Communications, Retail Optical, Wellness, Nutrition Stores, Hospitality, Real Estate, Publishing, Technology, Media, Events, Medical Tourism, Trading and Marketing & Distribution. Thumbay Group today employs close to 5000 people, which is projected to increase to around 25000 by the year 2022, with the completion of ongoing and upcoming projects. The Thumbay chain of hospitals, the constituent teaching hospitals of the Gulf Medical University are one of the largest healthcare services providers in the UAE, serving patients from over 175 nationalities. The Gulf Medical University (GMU) which is one of the leading private medical universities in the Middle East region, attracts a student cohort of 80 nationalities and faculty and staff from over 25 countries. Currently, Thumbay Group is focusing on its strategic long-term plans which will see the group scale its businesses almost ten times and expand its operations globally. The Group plans to build three more international campuses in the next five years. This is in addition to the plans to expand the chain of academic hospitals to 15 worldwide by 2022, with a total capacity of 1000 beds in the UAE, 1500 beds in India and 750 beds elsewhere in the Gulf and in Africa. The group also plans to expand specialized retail outlets. 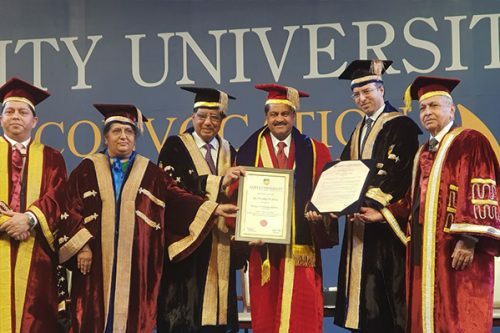 Picture details: Founder President of Thumbay Group, Mr. Thumbay Moideen receiving the honorary doctorate from Founder President of Amity University – Dr. Ashok K. Chauhan, Chancellor – Dr. Atul Chauhan, Chairman of Amity PACIFIC Forum – Dr. Ajit Kumar Nagpal, and other officials.